Home » Pan with a human body and the legs of a goat. Pan. Greek sculpture and monument of ancient art. A small statue of Pan, represented in the usual manner with a human body and the legs of a goat. The hair and beard are rough and shaggy, the ears are long and pointed, and at the top of the head is a projection, possibly the base of the horns with which this personage is furnished, unless indeed these objects are intended to be represented by the two rugged processes which rise on each side of the upper part of the nose. 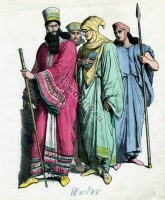 In his left hand he bears the pedum, or shepherd’s staff, his right is employed in an offensive action still used in Italy among the vulgar when wishing to insult any one. Its origin and it`s meaning it is unnecessary to explain; indeed, this arm being modern from above the elbow, it is by no means certain or even probable that such was the action of the original figure. The knees are profusely furnished with rugged locks of hair, which mask the union of the human and animal portions of the statue, a principle of treatment almost universally prevalent in ancient works of art, where unnatural combinations, which it would be difficult to connect gracefully, are concealed, generally by foliage. The shanks of both legs have been partially restored. The workmanship of this figure is unusually good, the human form is well understood, while the hard rugged development of the muscles indicates the half human, half animal character. It has probably formed part of a group, the expression of the face seeming to indicate a reference to some other figure from which it has now been accidentally separated. In describing this figure as Pan, it may be as well to remark that there is much confusion about the proper denomination of the sylvan gods and followers of Bacchus. The scholars and writers on antiquities, up to the time of Winckelmann, apply the term Fauns to the human figures with tails and pointed ears, while they term the figures with goat’s legs sometimes Pans, at other times Satyrs. 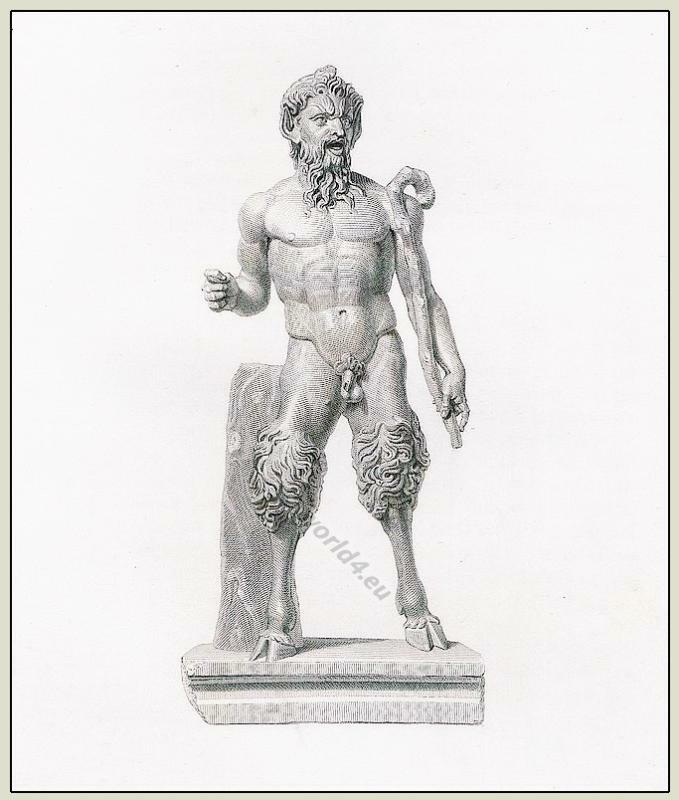 Since Winckelmann’s time it has been the general practice of the German archaeologists to apply the term Satyrs exclusively to the figures formerly called Fauns, and to describe all with goat’s legs as Pans. 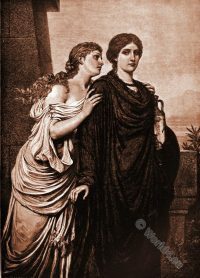 Before appealing to any modern authority, we will endeavour to elucidate this inconsistency by quoting chronologically such passages and expressions in ancient writers as describe the form of the personages in question, and such monuments of ancient art as most satisfactorily illustrate and corroborate these passages. Marc Antony and the dead Caesar. 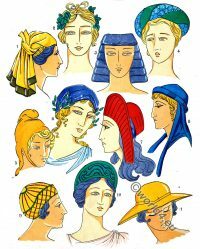 This entry was posted in Ancient, Ancient Greece, Hairstyle and tagged Ancient Greek Costumes, Ancient sculpture on 8/16/13 by world4.